Compare the images and say why the people might have chosen these kinds of meal. 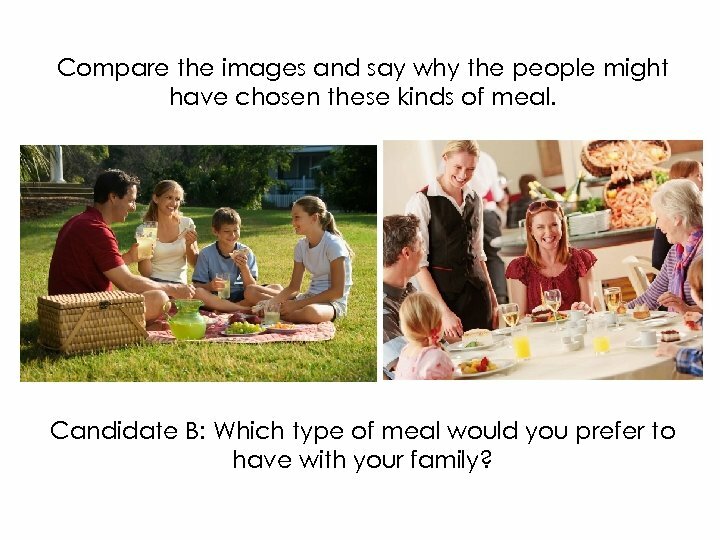 Candidate B: Which type of meal would you prefer to have with your family? Compare the images and say what the benefits of exercising in these ways might be. 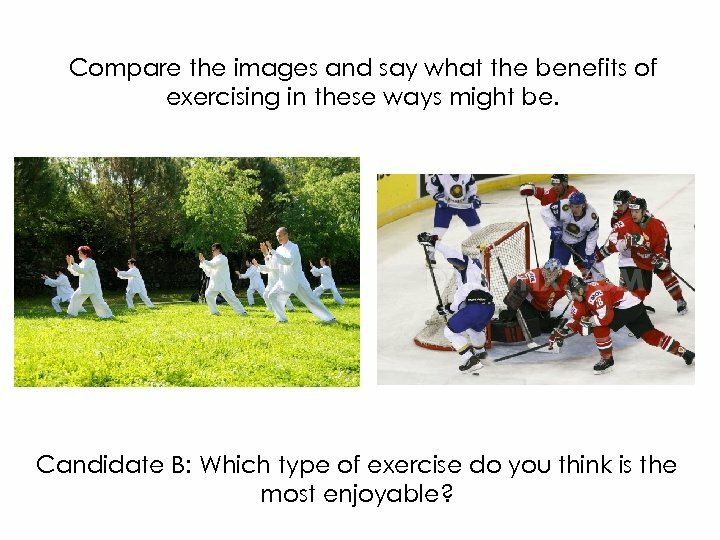 Candidate B: Which type of exercise do you think is the most enjoyable? Compare the images and say how spending time with animals benefits these people. 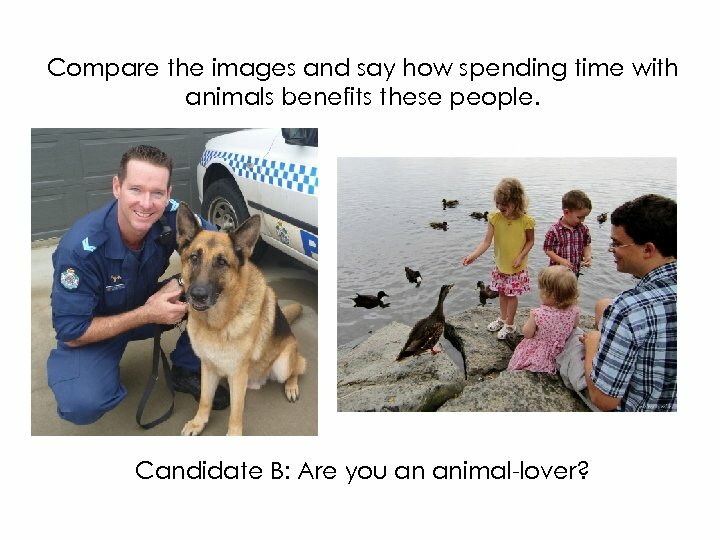 Candidate B: Are you an animal-lover? Compare the images and say why these people might have chosen their jobs. 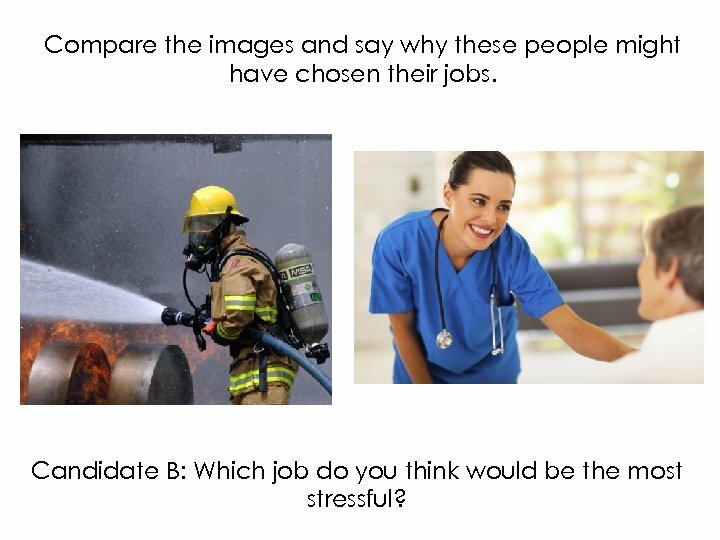 Candidate B: Which job do you think would be the most stressful? 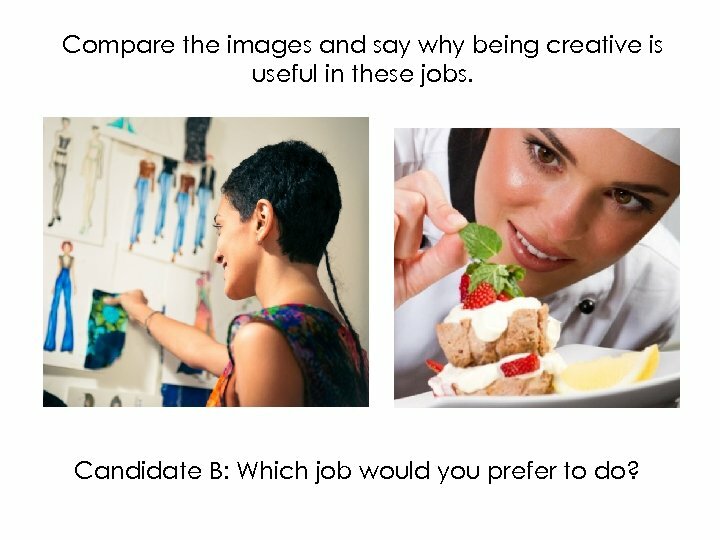 Compare the images and say why being creative is useful in these jobs. Candidate B: Which job would you prefer to do? Compare the images and say how people might feel while doing these holiday activities. 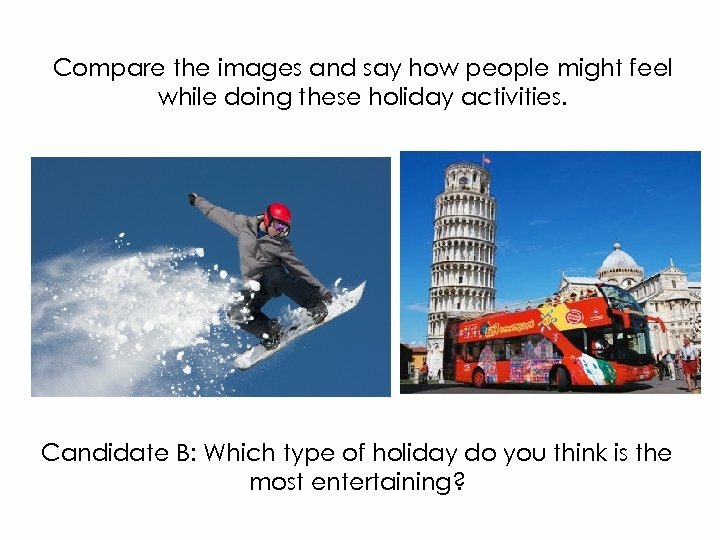 Candidate B: Which type of holiday do you think is the most entertaining? Your city would like to encourage more people to recycle. Here are some ideas they are considering. -First talk together about the advantages and disadvantages of the different ideas. - Now decide which TWO ideas would work best. 1. Some people say that recycling is a waste of time, do you agree? 2. 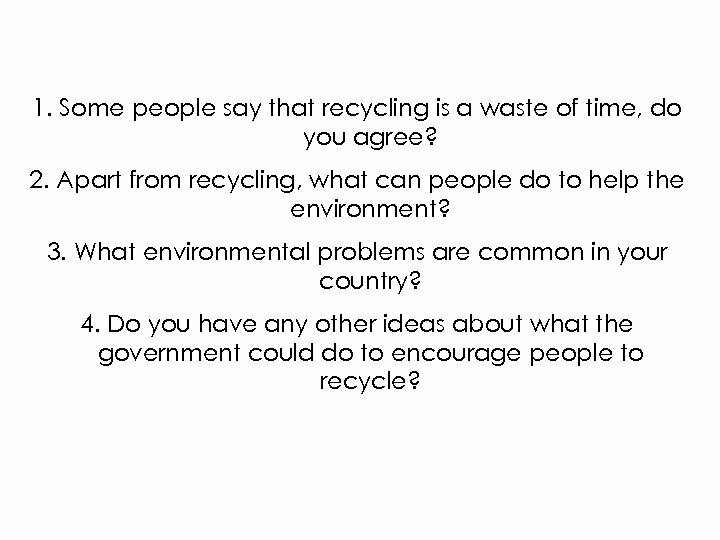 Apart from recycling, what can people do to help the environment? 3. What environmental problems are common in your country? 4. 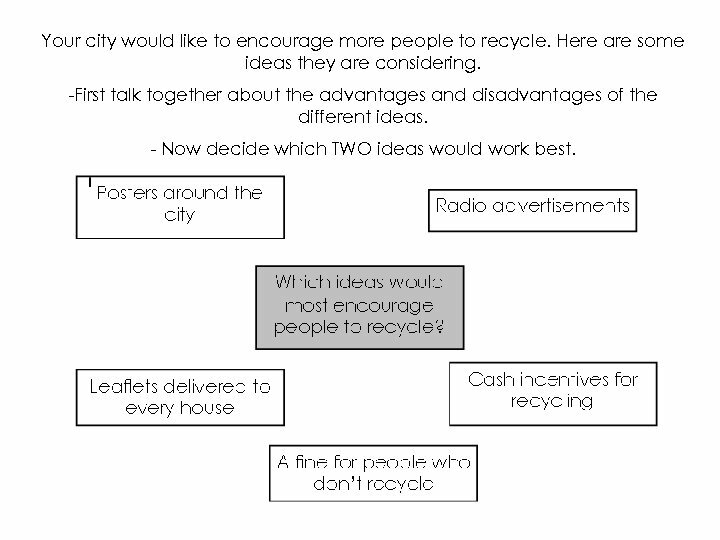 Do you have any other ideas about what the government could do to encourage people to recycle? 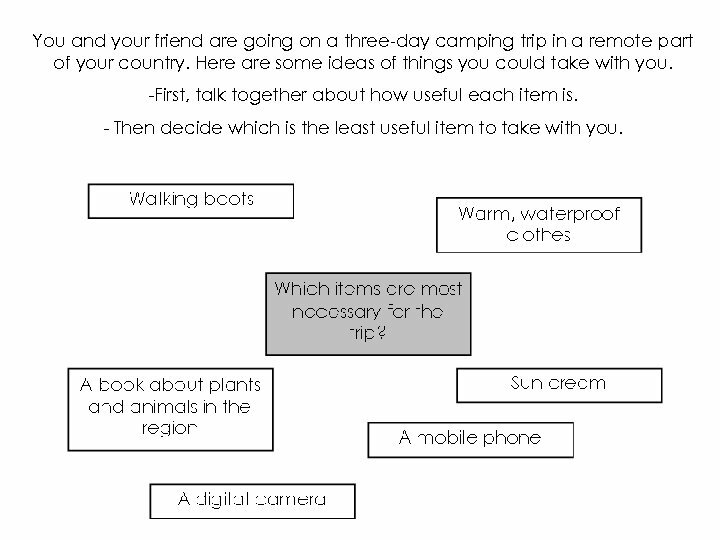 You and your friend are going on a three-day camping trip in a remote part of your country. Here are some ideas of things you could take with you. -First, talk together about how useful each item is. - Then decide which is the least useful item to take with you. 1. Why do people enjoy spending time in nature? 2. Would you rather live in the city or the countryside? 3. 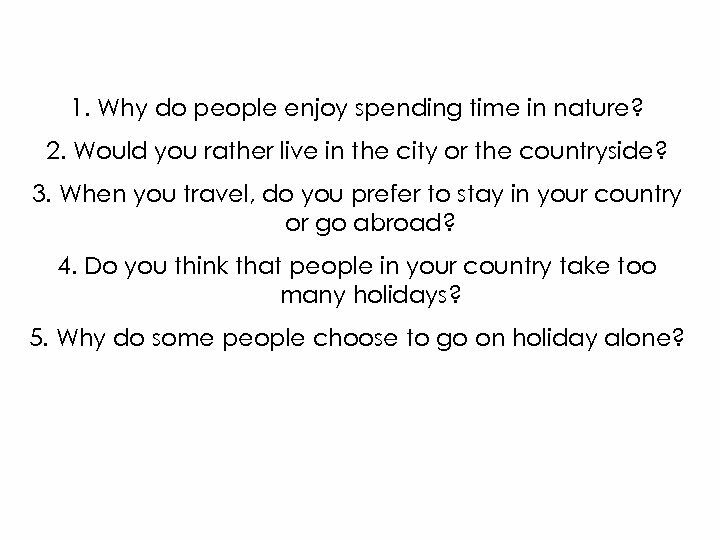 When you travel, do you prefer to stay in your country or go abroad? 4. Do you think that people in your country take too many holidays? 5. Why do some people choose to go on holiday alone? A couple is opening a small hotel in the centre of your city. Here are some ideas about facilities they could offer. -First, talk to each other about how popular these facilties might be with guests. - Then decide which two facilities guests would most appreciate. 1. When you go on holiday, do you prefer staying in hotels or some other kind of accommodation? 2. Why is eating out so popular in many places? 3. Would you like to work in the travel industry? 4. Do you think your city is a good place for tourists to visit?